(MENAFN - PRLog) Humans can distinguish at least one trillion distinct smells, yet many people find it difficult to precisely describe them. Due to this, the world of aroma has traditionally borrowed its language from the other senses. 1 2 3 4 5 TEALEAVES x Microsoft x Cooper Hewitt x 12.29 all-female panel at SXSW 2019 Icons from Microsoft's Inclusive Toolkit taught within RISD, Brown, UW, and MIT Language of Aroma Photography: Woman on Rock with Flowers Learnings on Aroma from Saskia Wilson-Brown of Institute for Art and Olfaction Language of Aroma Photography: Woman Listening to Music and Observing Art AUSTIN, Texas - March 10, 2019 - PRLog -- The luxury tea blender of choice for five-star hotels and Michelin chefs worldwide, TEALEAVES, to host The Language of Aroma: Designing for Inclusivity at the 2019 South by Southwest (SXSW) Conference and Festivals on March 10th, at the JW Marriott Salon 6 from 11am to 12pm CST. The company has partnered up with the female world leaders on design, curation and olfaction, including panelists from Microsoft, and Cooper Hewitt, a Smithsonian Design Museum, to showcase the importance of aroma on the human condition and discuss how principles of inclusive design can be used to bring further sensory accessibility to our world. "Aroma takes us to new heights. It gives depth and memory to experiences that would not be the same in its absence. Any great chef or wine maker would by far agree that aroma plays such a critical role in what they do - but how do you convey that level of excellence to someone with a temporary or permanent inability to smell? It was then that we realized that aroma could really be seen as an issue of inclusive design and embarked on an exploration of with the leading minds in culinary, technology, branding and accessibility to understand how to better share this added dimension with all," says TEALEAVES CEO Lana Sutherland on the inception of the project. "This exploration is important in highlighting the ways aroma can positively impact society. It's particularly interesting as we explore how to evolve the inclusive design practice at Microsoft in new directions embracing all senses. How might we apply inclusive principles to aroma? Just imagine the possibilities," says Margaret Price, Principal Design Strategist at Microsoft. "Aroma has the ability to inspire or transport, ultimately enhancing the human experience. People have multiple senses working together at any given time. When one sense cannot be used, how can another? Our role as experience creators isn't to "fix" what someone is "missing" but to fully leverage the way we interact with the world," she adds. 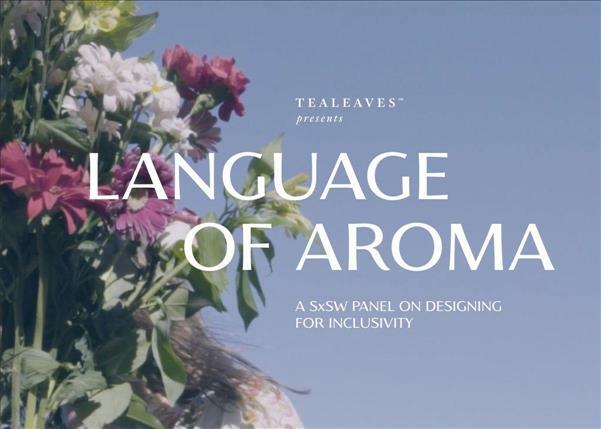 SXSW attendees will have the opportunity to be a part of this all-female conversation surrounding the importance of aroma to the human condition as well as get an in depth explanation of the innovative principles Microsoft pioneered in the development of inclusive design thinking. Building upon these principles, TEALEAVES CEO, Lana Sutherland will also discuss the undertaking of creating an entirely new language of scent in conjunction with University of British Columbia Faculty of Sciences and Microsoft. As Co-Founder and CEO, Lana establishes long-term vision and values for TEALEAVES, a leading luxury tea brand that crafts bespoke teas for its exclusive clients ranging from five-star hotels (Four Seasons, Mandarin Oriental, Ritz Carlton, St. Regis, W Hotels, Park Hyatt, Rosewood, The Standard) to Michelin star and celebrity chefs (Ducasse, Gordon Ramsay, Jean Georges), worldwide. Clients also include the Food and Beverage programs of American Airlines and Disney. Margaret Price is an explorer of the relationship between culture, humanity, and, technology. She drawsfrom marriage therapy, philosophy, biology, psychology to deconstruct how to embrace and sustain what makes us human in a digital age. Margaret studies human nature and monitors the cultural landscape to identify areas for creative and strategic growth. Her passion for identifying latent human needs, framing opportunities, and fueling experimentation has taken her to over 40 countries. Margaret's career has placed her on the forefront of product innovation and organizational transformation. At Microsoft, Margaret's strategy and content is featured in the Inclusive Toolkit which was awarded by IXDA , nominated as a FastCO World Changing Idea ., and was featured in the Smithsonian – Cooper Hewitt Design Museum. As an expert in design curriculum, and service design, her courses have been attended by over 12,000 at Microsoft and are taught in universities around the world. Most recently, within NYU, MIT, and, Brown. Ruth Starr is an educator committed to broadening Cooper Hewitt's audiences and ensuring the museum is welcoming to all. Ruth works on accessibility efforts across the museum, including integrated education, exhibition, and digital initiatives which serve to improve how the museum engages visitors with disabilities. Through innovative exhibitions and experimental programming, the museum explores intersections across design and the human experience. Ruth is an ASL Interpreter and serves as communications chair of the Museum Access Consortium (MAC), an association that provides a network for cultural professionals to share best practices and participate in dialogue around accessibility within cultural spaces throughout the New York metro area. Established in 1994, TEALEAVES is one of the very few tea blenders in the world, known for crafting the highest quality teas in small batches by hand. TEALEAVES strives for perfection, driven by the never-ending quest to make the perfect cup of tea. With the philosophy of inspiring creativity and connections through the art of blending, TEALEAVES has gripped the hearts and minds five-star hotels and Michelin Star chefs, worldwide, as their tea brand of choice for over two decades. Sourcing ingredients from over 90 countries and keeping only 1% of the tea leaves presented to them from the world's highest grade gardens, TEALEAVES hopes to stay people's "cup of tea" for generations to come, whether in a five-star environment or in the luxury of one's home. More information is available at TEALEAVES.com . Microsoft is the the worldwide leader in software, services and solutions that help people and businesses realize their full potential. Microsoft Design is the pioneer of Inclusive Design in the technology industry.